Yes, its true, once thawed Otolith’s delicious superior quality seafood will remain wonderful and ready to cook for up to seven days while refrigerated. 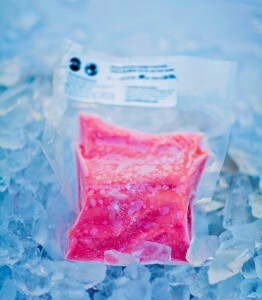 Ideally, we want to thaw then cook our blast-frozen sushi grade Otolith seafood. Realistically life gets in the way of our best plans and often we have food that is ready to cook even though we are not [ready]. Seven day refrigerated quality retention is especially convenient for Otolith’s clients that are planning to eat some of their wild fish on the same day it thawed and cook the remaining fish another day. Once thawed, your superior wild fish from Otolith may be kept under refrigeration for up to 7 days without diminishing its taste or texture. It will not be safe to eat raw as that use requires immediate preparation and consumption after the Otolith 20 minute Quick Thaw and has a maximum duration of safe raw consumption of 6 hours when properly handled and stored 40 degrees F or below. The best way to store Otolith’s fish in the refrigerator is to keep it in its specifically designed pouch to reduce dehydration. If the pouch is already removed then Otolith recommends you wrap the fish in plastic wrap to retain its natural moisture then place it in a sealed container or bag. When storing Otolith’s fish in the refrigerator there may be a risk of leakage. To avoid a messy fridge, use a container to store your fish or keep it in the pouch and place it in a bowl.